There is certain craze for Peter Mergener. For his music! Having remixed and fused the both passages of Creatures in a single album, Creatures 2020 in April 2014, the German synthesist revisits Passage in Time in October of the same year. And now it's the turn of “Take Off”, his 3rd solo opus which appeared on the German label Cue Records in 1992. Like with Passage in Time, this new version of “Take Off” includes a remastered edition of the original album as well as a bonus CD which includes music, and that's not completely clear to me, composed quite recently as well as some different versions (I find that indeed Sunlight can sound like The Eagle and that A Little Bit of Something has some similarities with On Wings) of tracks which appeared on the first edition. The whole thing is carefully presented in a 2 CD digipack which however offers almost no information. 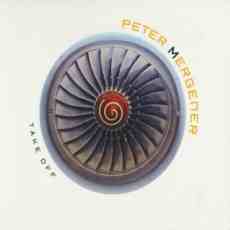 And on the album and on Peter Mergener! Amplifying so this perception that there is still a culture of secret around the mythical musician who left the Software adventure at the end of the 80's. And as it's only quite recently that I discovered this period of Mergener, I cannot pronounce on the differences, good or bad, between both works. All that I know on the other hand is that it's a very good album! We find here this magic which was behind the first 3 years of Software, from 85 to 88, with slow harmoniously jerky structures of rhythms, such as stroboscopic filets falling to pieces, which progress in a great deal of cosmic effects and in jolty orchestrations. Outer noises, like voices or dialogues of cosmonauts or still whistlings of shuttles as well as noises of machineries, have always decorated the cosmic soundscape of Software. And by ricochet the one of Peter Mergener. We thus find them massively on “Take Off” and this is what open the title-track. Winds of Orion and dust of cosmos are sticking to some slow intergalactic woosh while far off a staccato movement reveals orchestrations which are similar to a sequence of suspense film. Layers of voices cogitate around this orchestral swing of the pendulum where sequences are grafted and waddle with a pace of mocking goblins. Already, the Mergener (Software) magic invades our ears. Lively and harmonious sequences, percussions and electronic jingles, riffs of keyboards and jerky violins are structuring a rhythm which passes in an accelerating mode, as a ride in the cosmic plains. A rhythm pecked by diverse elements of percussions and wrapped by the beautiful harmonies of a synth among which the seraphic layers weavers of earworm add some more of depth to the soundscapes of “Take Off”. It's lively! It's a good electronic rock of the 80's with a great sound aestheticism. "Icarus' Flight" is a very beautiful track is which uses completely all these facets, and from cosmos and from synth software. Cosmic woosh and wiish are pushing sound prisms which always sparkle in the breezes of Orion. Electronic effects are chirping and the synth layers adjust the tones with a delicate approach tinted of nostalgia while the tears of violins and the fluty caresses add to this elegiac dimension. It's delicate and rather oniric. We are near New Age! Winds become more strident, awakening a thick cloud of sequences which hesitate to structure the rhythm of "Icarus' Flight" of which the approach remains furtive and get snuggled up in these sighs of flutes. And the sequences dance. They dance, like in Electronic-Universe, with jerky orchestrations, structuring an ambient rhythm. A cosmic lullaby which little by little exchanges its passivity for a structure as much lively than morphic, rather similar to the progression of the title-track, which is so close to these progressive and rather ambiguous structures of rhythm which make the charms of the Peter Mergener's repertoire. Each track of “Take Off” is soaked of these sound subtleties rich in contrasts and in colors. "The Eagle" is a beautiful slow dance with a poignant guitar and jingles on the background which remind me the duet Seiler/Lorenz in the Passage album. Wonderful, "On Wings" is literally sculpted in the sequenced harmonies, you know all these glass ringings which sing and shape an ambient rhythm, of the Electronic-Universe saga. And always there is this fine gradation in the envelope, as rhythmic as orchestral, which gives so much depth to the structures of Mergener. "Between Worlds" is a little moment very ambiospherical which is tied to the rather melancholic piano of "A Moment to Look Back". "Freedom of Space" proposes an ambiospherical structure fed by carillons lost in suave lunar orchestrations. Electronic effects, cosmic voices and hollow breezes weave an astral shroud where jingles of percussions and cymbals get carried away. Voices of NASA and murmurs of cosmic Elves are borrowed from the decoration of Software whereas that the soft drumming of the sequences shape an anesthetic lunar march. It's rather morphic and the sequences hammered on a musical anvil forge a kind of lunar ballet which loses its hypnotic charms in an electronic language filled up of organic tones. "Return to the Blue Planet" is more or less modeled on the same principle with a slow ambiospheric and ambiosonic intro which turns its gradation of the ambiences for a structure of ambient rhythm fed by balls of sequences which wind in spirals. These balls swirl into minimalist loops in a structure of rhythm which grows with jingles of metallic percussions, a little as in Cosmic-Excursion from the Electronic Universe II album but with a more fluid tempo. Layers of violin and cello harpoon this rhythm skipping with the orchestral jerks which cut out the ritornellos of sequences and direct the second portion of "Return to the Blue Planet" towards these structures of rhythms all contrasts, between the ambient and the lively, of both Software and Peter Mergener universes. "Landing" ends “Take Off” with a good very lively electronic rock where the sequences reveal all the wealth, as rhythmic as harmonic, of Peter Mergener. We love at the first listening! CD 2 proposes us structures which are far enough from what we are used to hear from Peter Mergener. And that begins with an all ambiospherical piece of music decorated by its lot of sound effects as well as synth layers and guitar laments which remind of the universe of Pink Floyd in Wish You Were Here. The voice of Stephen Hawking is dawdling around in the background and remains less attractive than that of a virtual woman. If we like the hollow atmospheres where we feel at light years from home, "Strange Voices" and "Extreme Conditions" with its huge waves of old church organ will know how to fill your expectations. We stay in the very Pink Floyd domain with "Solarsailer" which is a good electronic progressive rock with lively percussions, loops of guitar and nice orchestrations. It's rather different of the Mergener/Software universe but we roll on the neck and we slightly tap the thigh. And the guitar of Achim Elsen, who is very good by the way, does very David Gilmour. We are more into ballad style? The slow and very poignant "Sunlight" and its heavy resounding guitar, one would say a hard rock ballad, is going to eat your soul. "When the Wind Blows" is also a beautiful ballad but in a more New Age style. "Nightflight" is a more electronic track, well at least for its intro, with a circular movement of very crystalline sequences which clink in a spectral shroud. Impetus of a line of bass and wrapping synth layers, perfumed by the shadows of an old organ, give a night-depth to a music, which does very Mark Shreeve by the way, which takes back the guides of another electronic rock filled of pastiches and of sound glitter of the 80's. "A Little Bit of Something" will keep its electronic identity throughout its 8 minutes, it's quite a piece of EM my friends, with an approach which is a little similar to "On Wings" but with a clearly more lively rhythm where the perfumes of Mergener/Software exhilarate our senses with a touch very TD from the Underwater Sunlight years. Is the second CD necessary? I read negative comments that I do not share. If we are a little far from the Peter Mergener's usual repertoire, the music remains very nice. And I always like that when an artist goes out of his comfort zone. 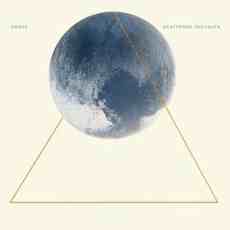 And it's obviously the case here where Peter Mergener touches a lot of styles; New Berlin School, E-Rock, ambiocosmic soundscapes, New Age and Synth Pop. There is for all tastes and I believe that it's the purpose of a bonus CD offered in a special remixed edition. Regarding “Take Off”? Well...It's another fine jewel of New Berlin School which is very near of what Software had given to us during the Mergener/Weisser years. Isn't what we wanted? Perge assumes completely the powers of its influences. Since the first album Dyad, released in 2012, the English duet gave itself as mission to remodel in studio version the great live performances of Tangerine Dream, periods Baumann to Schmoelling. And Matthew Stringer and Graham Getty feel very at ease with this mission which raises not a controversy in the fans' circle which tear away nevertheless the hair of the eyes at the slightest spark. That my friends, it's the sign of an immense respect towards both musicians. It's also the sign that Perge does things very well. Inserted in a LP laminated sleeve style which looks so much like White Eagle, “Scattered Thoughts” is offered in manufactured CD, the album is also available in download, in the shape of a mini LP. Like in the old time of vinyl album. The packaging is very professional. And the contents? Lamentations of metal in pain open "Deja Entendu". There is not 10 seconds to the meter that already a movement of sequences made skip and gallop its keys which adorn themselves with tones infected by resonances. Another line of sequences emerges one minute farther. Its movement in zigzag brings a fluty chant and removes for a moment the first line of rhythm. We seek in our head, and our memories, from where this music can be so extracted. Of what period! The answer can be somewhere between Phaedra and Stratosfear, because in spite of all the subtleties brought, the essences of this era perfume our ears even if "Deja Entendu" is more based on the concept of the originality. The Mellotron is fabulous and its fluty solos, as well as its airs, take the center stage over this chthonian choir, which is more seraphic than threatening, and this movement of rhythm of which the intonation goes up and comes down such as a replete snake. The keyboard layers and effects are flavoring the atmospheres which bronze themselves of the 80's. It's like to unite White Eagle with Phaedra. From a flute, the Mellotron is transformed into synth and throws twisted solos while the rhythm becomes more electronic and that keyboard/synth pads are invading our ears. "Deja Entendu" enters in another phase with the same structure of circular rhythm where the keys skip in a tonal plain filled by some drizzly layers and where the synths replace these singings of flutes with piercing and harmonious solos inside a sound envelope enriched by the perfumes of White Eagle. The ending is leading us towards a more pensive moment with an acoustic guitar which lays down its notes and sculpts a delicate lullaby in the gardens of Eden. You suspect although "Hyperbole" is modeled on the invaluable ballad Hyperborea? And it's very nice. More a remix than a revision of a live performance, I don't think that Hyperborea was played in concert in that era aimed by Perge, "Hyperbole" is magnificently well improved here. The same goes for "Troposfear" where the contemporary nuances will make of it one of our favorite piece of music in Perge repertoire. "Horizane" is a fascinating fusion between these two cult tracks from the famous Poland album. The floating sound perfumes are there. These metallic breezes which come from industrial deserts... they fill the air! There is a skillful mixture of fluty and anguished layers which float in an intro filled of the sonic winks from Horizon. The synth which is whistling here with so much sharpness takes the shape of these famous airs with a breeze of novelty in the approach and the first minutes are in accordance with the vision of the atmospheres which are redrawn. The structure of rhythm is slightly more floating with loops which sparkle like springs in the furrows of metallic jingles. The bass pulsations and the apocalyptic lines of synth! We are so near and so far at the same time, from where the seduction. We wouldn't know the name of the track that only few of us would have make the link. The rhythm develops with perpendicular pulsations, a little as a morphic techno which is set ablaze by good solos of a twisted synth with harmonies a bit of nasal . The music dives into an ambiosonic oblivion at around the 13th minute spot. There where the electronic and sequenced percussions of Barbakane, as well as these sound effects in White Eagle, have hammered our loudspeakers in 1984. Still there, everything is nuanced. We wouldn't know the genesis that we would think of hearing an excellent piece of EM. And it's unarguably the big strength of Perge. Make something new out of something old which sound like something that we recognize vaguely between the meanders of time. The music? Oh yes, “Scattered Thoughts” is very strong. The best of Perge? We say that every time. I don't know if there are still manufactured CD available, but I recommend it strongly. It's more than a new way of hearing Tangerine Dream. Perge is like this spiritual son of the Dream who still plays somewhere in the corridors of time. Ron Boots is a central character in the universe of contemporary EM. The one that we can easily compare with big names such as Klaus Schulze and Edgar Froese opened the barriers of EM in his native Holland by setting up a prestigious label, which aligns constantly works and artists of high quality, and by organizing major festivals of EM; E-Day and E-Live, two events which underline the spring and the autumn one of Ron Boots' favorite seasons. At the same time he takes part in other festivals, bringing with him the fresh sound breezes of the Netherlands School. This is how he finds himself in the famous The Awakenings festival in Burton upon Trent in England on September 13th, 2014. A special evening which stars some big names of the Dutch EM of which the road was laboriously opened up by Ron Boots. Flanked by Eric Van Der Heijden on keyboards, Frank Dorittke on guitars and by Harold van der Heijden, superb on drums, Ron Boots offered excerpts from Standing in the Rain in a musical approach which included the magic of MorPheuSz, in particular the elements of the very good Tantalizing Thoughts at the Dawn of Dreams. The encore, "Sometimes it Works", regrouped all the Dutch artists present in this evening, either MorPheuSz, Beyond Berlin, Rene de Bakker and René Splinter in a moment of pure magic with a great minimalist Berlin School track. 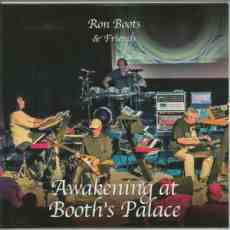 Offered in a limited edition, and possibly in a download format, “Awakening At Booth's Palace” is the audio witness of this great special event. Confused murmur of voices behind a microphone, waves of synth twisted by melancholy and metallic noises which clink behind a wide bank of sizzling smoke, the introduction of "Morphology" shakes these atmospheres in order to merge all these elements in some hoops of metal which clash their circles in a figure of rhythm as much charming as abstract. 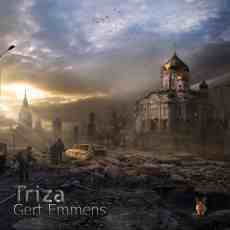 Floating riffs of keyboard get out from these mists while Frank Dorittke's guitar wakes up quite slowly and take the harmonic control of a lively and spasmodic phase of rhythm. The six-strings of F.D. is riding on the rhythm of "Morphology" which is supported by a good drum and by the fluty airs of the synths. Effects of synth add a touch of psychedelism with loops which roll on a structure of which the anarchy will never have been so melodic. "Morphology" turns out to be a very nice electronic rock with a good drum and good guitar solos while that Ron Boots and Eric Van Der Heijden assure the electronic part with good effects and a sober sequencing pattern. Between the melancholic and melodious approaches of Standing in the Rain and the progressive lanes of MorPheuSz, the breezes of Tantalizing Thoughts at the Dawn of Dreams are floating all around here, “Awakening At Booth's Palace” is an album at the height of From the Forgotten Rooms of a Lonely House; a split album where Ron Boots and MorPheuSz divided the 60 minutes of music in it. Except that here, the four artists are together on stage all the time in the MorPheuSz outfit. "At the Booth Palace" exploits completely its 29 minutes to develop an introduction misted by nebulous fog which is pierced by a waddling movement of sequences. The guitar lets float some chords which get mix to the dark pulsations while a synth shapes a kind of a suspended brook and whereas the other one frees harmonies gently whistled. Little by little "At the Booth Palace" weighs down its atmospheres with a line of bass sequences which climbs an invisible peak and a synth which plasticizes a sound wall braided by placid waves and by drizzle. Slow and heavy, it is rather lively. We wave of the neck. It's more electronic with some very present synths which create warm atmospheres on a rhythm where the bass sequences gallop slightly on a sober play of percussions. The music becomes more silent at the 13th minute point where the effects of brook remain and where a breeze of flute amazes our more attentive ears. Frank Dorittke is seasoning this moment of serenity where the fragrances of the 70's (Stratosfear on top) embalm our senses. And quietly "At the Booth Palace" wakes up to reach a finale which will switch its heavy rhythm for ambient phases and a cosmic blues fed by good solos, and by the guitar and by the synths. After a slow and very electronic introduction, "DGF" proposes a rather lively rhythm which is sculpted by slow circular undulations. The structure reaches a wall of atmospheres in the halfway, where the shadows of the initial structure always roam, before taking back its flight with a more steady structure. There are perfumes of Pink Floyd here, and that smells the improvisation at full nose. But not as long as on "Sometimes it Works" where Beyond Berlin, Rene de Bakker and René Splinter are joining MorPheuSz for one encore which comprises all the perfumes of the EM from the analog years and the strength of the electronic progressive rocks of the Dutch quartet. The introduction is magnetizing with lines of synths perfumed of the trumpets of Jericho which shout on a hypnotic down-tempo. The guests add their touches on this slow rhythm which is bitten and thrown by the guitar of F.D. towards the galloping tops, a structure of rhythm which returns constantly in this album. I don't know if there are copies left at the moment I wrote these lines. “Awakening At Booth's Palace” was printed in a very limited edition. I saw some copies left on the Groove web shop. If so, I suggest to the fans of a wild and heavy progressive EM a la Porcupine Tree and Ozric Tentacles to jump on this occasion because I am convinced that the fans of MorPheuSz have jumped at both feet on this rather creative album for an evening where the music of Ron Boots gets melt so smoothly to that of MorPheuSz, and vice versa. This is solid progressive electronic rock!